Shark, Weak: Toothless 'The Meg' Snatches Mediocrity From The Jaws Of Defeat It's a "somewhat self-aware, mildly sci-fi tinged, numbingly unimaginative watering down ... of a genre landmark, relocated to Asia and aimed squarely at the world's largest movie market: China." 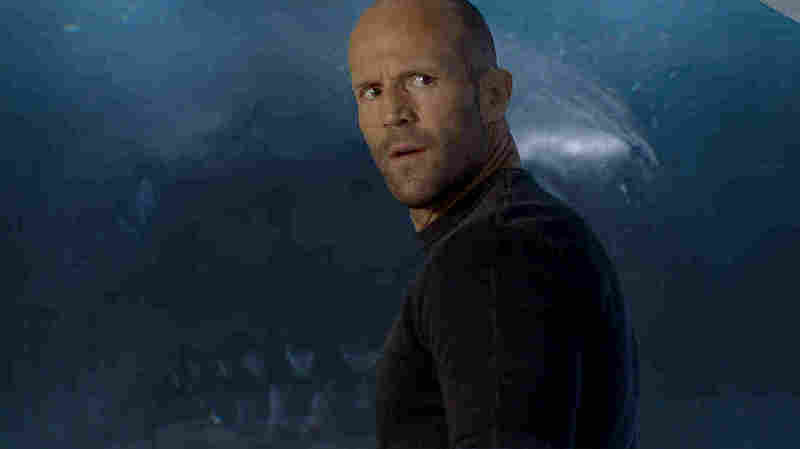 She Prefers To Be Called "The Peggy": Jonas (Jason Statham, obviously) reflects the audience's incredulity in The Meg. Uneasy lies the wrist that wears the big diver's watch, but Jason Statham never looks especially perturbed in The Meg, an agreeably daft if disappointingly bloodless sea creature-feature from the auteur who brought you Three Ninjas and Phenomenon — the film that asked us to imagine, What if John Travolta were smart? Of all the thrillers made about tender, juicy humans splashing away from ravenous giant sharks, The Meg is undeniably the most recent. It is to Jaws what Skyscraper was was Die Hard: A somewhat self-aware, mildly sci-fi tinged, numbingly unimaginative watering down (no pun) of a genre landmark, relocated to Asia and aimed squarely at the world's largest movie market: China. It's not A-okay, but it's C-okay. Orson Welles purportedly observed that making a bad movie takes just as much work as making a good one. Halfway through The Meg, I found myself wondering if making a movie that is neither bad nor good is the easiest option of all. And yet The Meg, freely adapted from a 21-year-old "novel of deep terror" by Steve Alten, is still a more diverting entertainment than Skyscraper, for reasons I shall elucidate in ascending order of relevance. "Are you saying we've opened up a superhighway for giant sharks?" is not an extraordinary line of dialogue from this film, but a typical one. The Meg was largely filmed in real, you can-even-go-swimming-in-it water, rather than in front of a green screen, and computer-animated sharks are more fun to look at than computer-animated flames. Statham—a former competitive diver, did you know, and easily the most talented chrome-dome involved in the Fast & Furious series—is a more agile and rakish action hero than Skyscraper's Dwayne Johnson, who is so prolific and yet so unwilling to show any trace of unlikeability or indecision onscreen that the political career The Rock is potentially cooking may already have begun. Fast forward five years, when a bunch of of oceanographers outfitted in a Bond-villain-worthy floating laboratory paid for by Rainn Wilson's Elon Musk-like figure is preparing an experiment: They intend to prove that a part of the ocean floor 200 miles off the Chinese coast is in fact merely a cold layer of extremely scientific exposition, leading to an even deeper ocean utterly unknown to science. Their expeditionary sub is piloted by Sharon Stone lookalike Jessica McNamee, an actor two decades younger than Statham who is nevertheless playing Jonas' ex-wife because the writers have seen The Abyss, too. Anyway, when that sub gets attacked and stranded miles beneath the sea, the last words McNamee manages to radio to the surface are "Jonas was right!" So now company men Winston Chao and Cliff Curtis have to lure Jonas back to confront his white whale, which is is technically a white shark. He may have spent the last half-decade lying drunk on a beach in Thailand (not hyperbole; the movie makes clear that this has been his focus), but he's the only man for the job! One casting bright spot is Ruby Rose, who plays a tough-as-nails ... well, exactly what her job is on this ocean laboratory is of less consequence than the fact that her name is Jaxx. Is any screenwriter worth his WGA card going to waste a moniker like "Jaxx" on a helpless damsel? Or someone who accepts a job in the middle of the ocean while concealing the fact she can't swim? No way, Bro. The Meg's literary source spawned a half-dozen sequel novels. One point in this movie's favor is that it's generous complement of false endings make it feel less like one movie than like a movie followed by two quickie follow-ups, and all in under two hours. Just when you thought it was safe to go back in the water, it's still not safe.